Caption slip reads: "Photographer: Olmo. Date: 1953-01-12. Reporter: Harmon. Assignment: Dream castle -- Monday. 9-10-11-12: Exterior of Milton S. Hopkins' dream castle at 4857 Melrose Avenue, Hollywood. 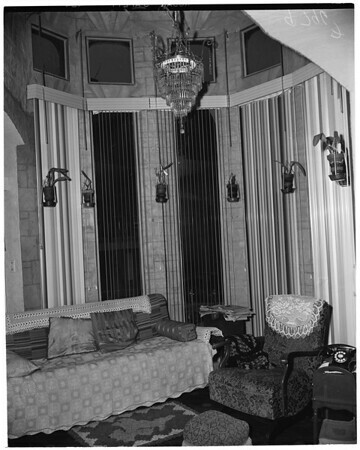 13-14-15: Interior of 18-foot tower off living room showing home-made chandelier with neon light. (Monday)." Another caption slip reads: "Photographer: Hecht. Date: 1953-01-13. Reporter: Harmon. Assignment: Dream castle -- Monday. 90-91: Milton S. Hopkins, 64, works cement on tower of dream castle."